Would legal pot hit Chicago gangs’ pocketbooks? Siva Iyer got us started on this question. Elmhurst resident Siva Iyer read Sudhir Venkatesh’s pop academic book Gang Leader for a Day, which got him thinking about the economics and industrial side of marijuana. The culture around weed has changed over the years, enough that Colorado and Washington have legalized the drug. Is Illinois on the verge of putting legalization to a test? Not likely, but it’s worth contemplating. Earlier this year the Illinois House passed a medical marijuana act. And the city of Chicago has decriminalized possession, a policy designed to free up police hours. Officers can now ticket for possession of fewer than 15 grams. Iyer, who works in the pharmaceutical industry, wondered how gangs would make up for any lost income if — one day — weed were sold on store shelves. 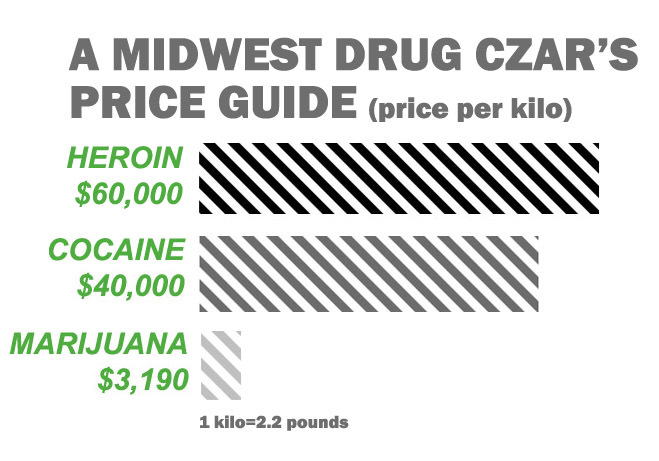 If Illinois legalizes marijuana, how could that affect the economics of the drug trade among gangs? Iyer and I went to visit Midwest drug czar Jack Riley in a downtown federal building. Riley is Special Agent in Charge of the Chicago Field Division for the Drug Enforcement Agency. The blunt-speaking agent described a “very toxic” and “profitable” relationship between Chicago street organizations and the Mexican cartels, but it doesn’t revolve around weed. Frankly, marijuana can be a logistical nightmare, Riley explained. It smells. It’s bulky. It’s hard to store. And it’s got a short shelf-life. That is, it’s the exact opposite of Chicago gangs’ and cartels’ actual drug of choice: heroin. Here are the economics, according to Riley: A pound of decent-grade marijuana can run between $1,400-1,500. A kilo of cocaine sells for about $40,000. The real cash maker, Riley said, is the more compact heroin, which goes for $60,000 a kilo. He said it arrives from Mexico 90 percent pure and is sold at a purity of nine to 12 percent on the street after being cut and pumped with additives. Riley said in the local drug trade, rival gangs collaborate these days over the dealing of heroin. The Sinaloa Cartel uses Chicago as a hub to distribute throughout the Midwest. The cartel’s equivalent of a CEO is El Chapo Guzman and he’s Chicago’s Public Enemy No. 1. The last criminal bestowed with that title was Al Capone. Riley said Mexican cartels still do the majority of trafficking of marijuana, but higher grades of marijuana arrive from the Pacific Northwest and Canada. At this point there’s reason to suspect that — even if Illinois tokers could buy legal weed from corner stores — these folks would still stay in business. “Regardless of what we did on the legalization side, it would never eliminate the black market,” Riley said. He calls Mexican weed “regular weed,” lacking the potency of domestic marijuana. He said his weed comes from California and is known on the street as “loud,” which is a pun on the loud smell and signals that it was grown via hydroponics. If Illinois legalizes marijuana, he said, the government would certainly tax the drug. But he explained that dealers already deal with a drug hierarchy and a tax of sorts: The weed connect sells to a middleman, who is charged a tax. That middleman might want to make $200 on the package, so he’ll “tax” the next dealer.